Turnips 2 Tangerines has taken the challenge! The “Simply Sesame Blogger Recipe Challenge” Turnips 2 Tangerines is one of 75 eligible food bloggers participating in Simply Sesame first annual recipe challenge. 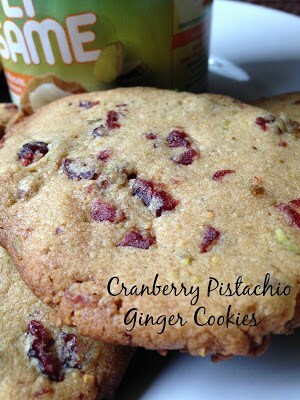 Pistachio Cranberry Ginger Cookies are fantastic. Pistachio Cranberry Ginger Cookies are studded with diced dried cranberries, diced crystallized ginger and finely chopped pistachios. 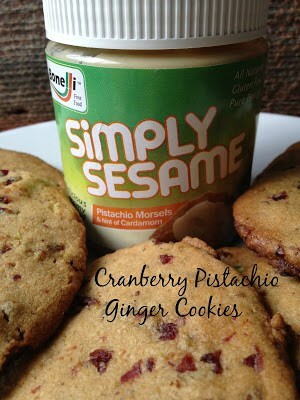 We certainly can’t forget the star of the recipe: Simply Sesame Pistachio Morsels with a Hint of Cardamom. 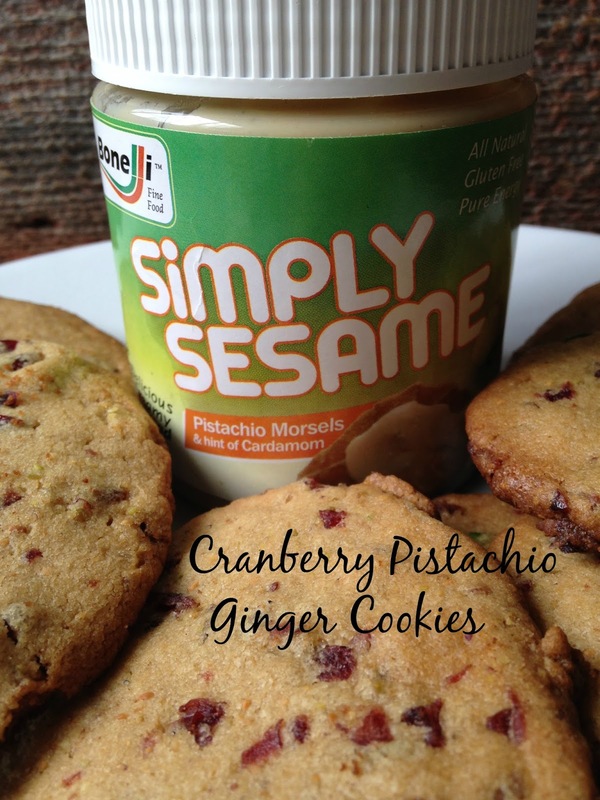 This creamy spread is absolutely delicious and perfect in this cookie recipe. Cookies are always a favorite in my house. I would rather eat a couple of cookies instead of eating a piece of cake. 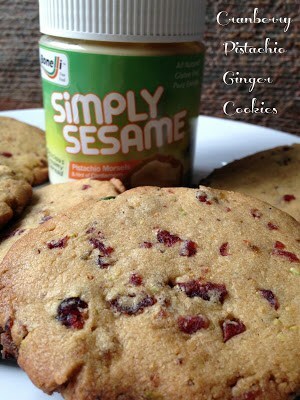 If you love a crispy cookie, you are going to love these. Crunchy, flavorful and slightly chewy from the bits of diced dried cranberries and crystallized ginger. 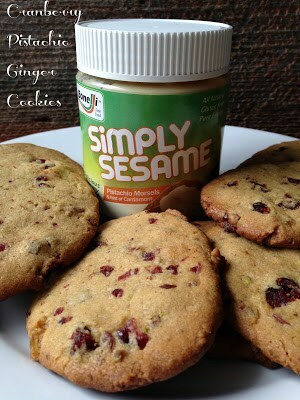 Our first recipe is made with Simply Sesame’s Vanilla with Almond Bits. Sesame Banana Espresso Smoothie is a delicious smoothie prefect for breakfast or late afternoon pick me up. This delicious smoothie has just the right amount of satisfying flavors. 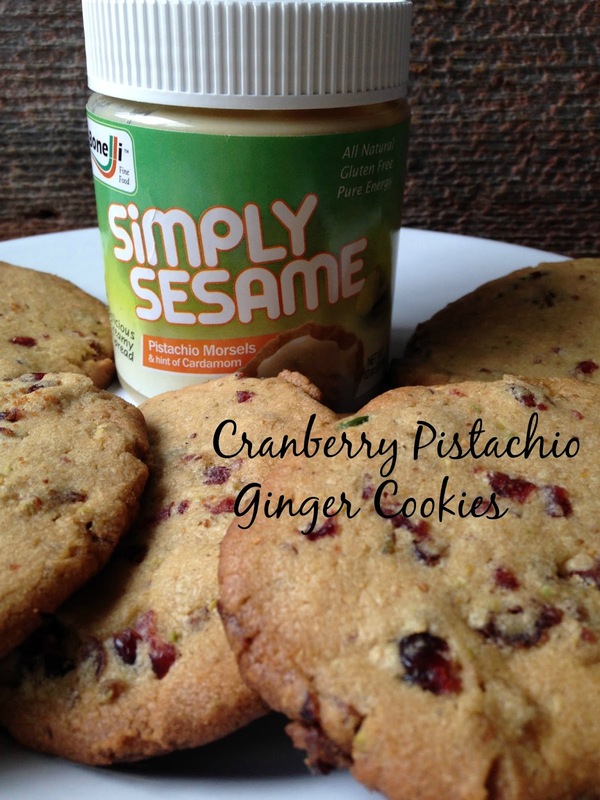 Try this smoothie with a couple of Cranberry Pistachio Ginger Cookies. Now on to our second recipe. Our second recipe created for “Simple Sesame Blogger Recipe Challenge” features: Simply Sesame Pistachio Morsels with a Hint of Cardamom. This sesame spread was absolutely delicious and my favorite. 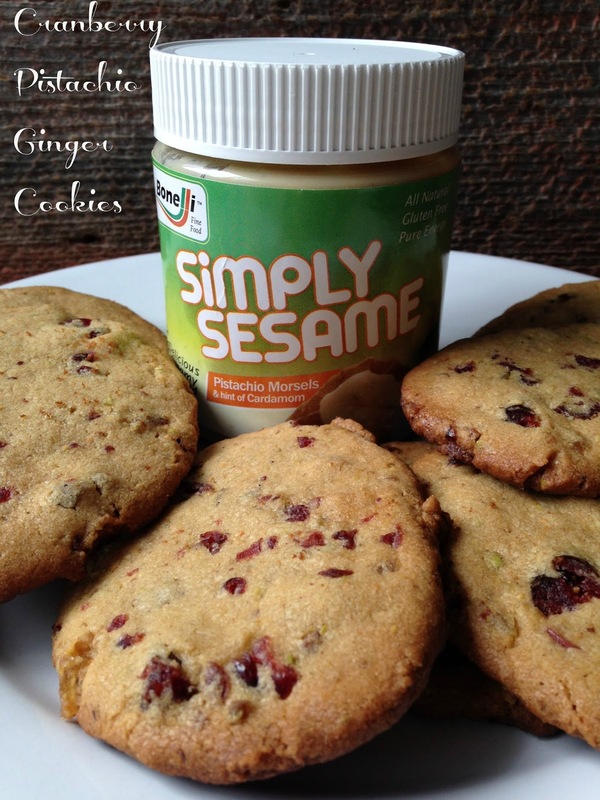 It worked perfectly in this recipe and created a light, crisp and slightly chewy cookie. I’ve made these cookies several times and everyone who has tasted them, loved them. In a small food processor, grind pistachios with vegetable oil until well combined. Set aside. In a bowl, with an electric mixer, combine butter and brown sugar until fluffy. Beat in egg yolk and vanilla extract. Beat in the pistachio/oil mixture until incorporated. Fold in simply sesame pistachio morsels & hint of cardamom spread. In a separate bowl, whisk together the flour and baking soda. Slowly add to butter/pistachio mixture. 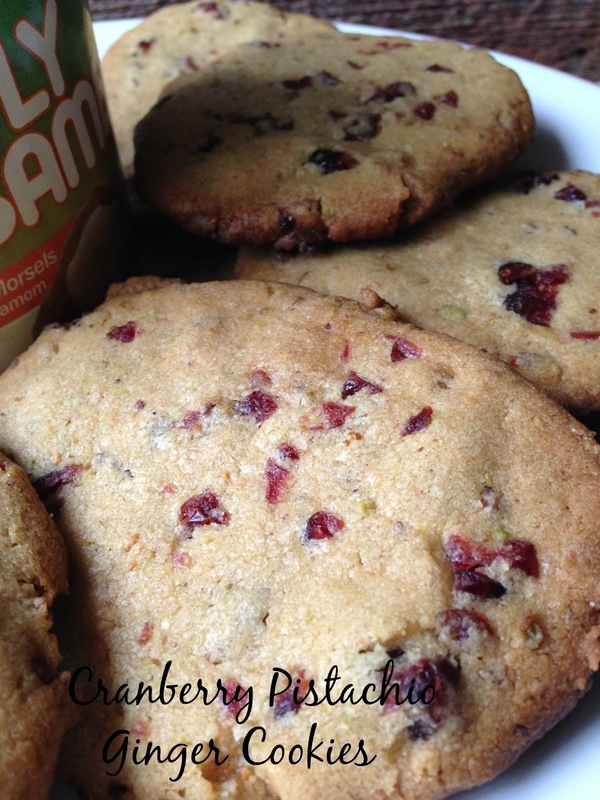 Fold in diced dried cranberries and ginger. Shape dough into a log. Wrap log in plastic wrap. Chill for 1 hour or up to 3 hours. Slice dough into thin slices. Press slices into a circular shape, using the palm of your hand. Place 2 inches apart on a baking sheet lined with parchment paper. Bake at 350º F for 12 to 15 minutes. Let cool on pan for 5 minutes, transfer to a cooling rack. *This recipe can easily be doubled with the same delicious results.